Self-doubt. Something every single artist experiences, almost on a daily basis…and for that matter, it is something that every human faces. I can usually work through my self-doubt rather efficiently, but every once in a while my self-doubt begins to feel like a huge ACME anvil that Wily Coyote dropped on me. Not so bad, you say? I agree. 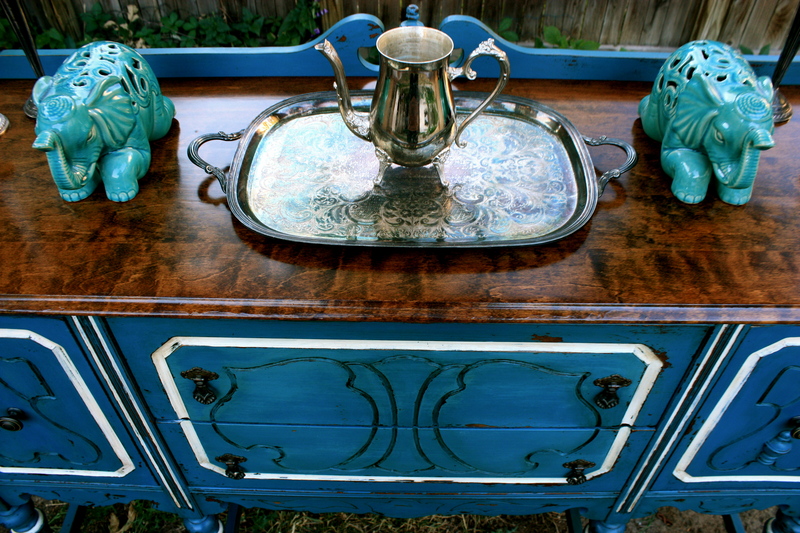 This antique buffet is like a dream come true for us furniture flippers. I mean, just look at those legs! And the apron! And the beautiful routed detailing! 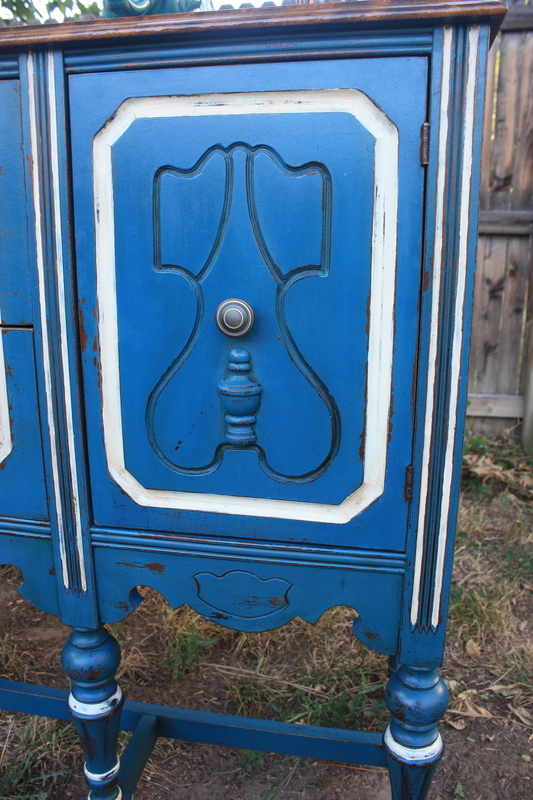 And those fantastic tear-drop-esque pulls on the drawers! What’s not to love, right? Well therein lied the self-doubt anvil. 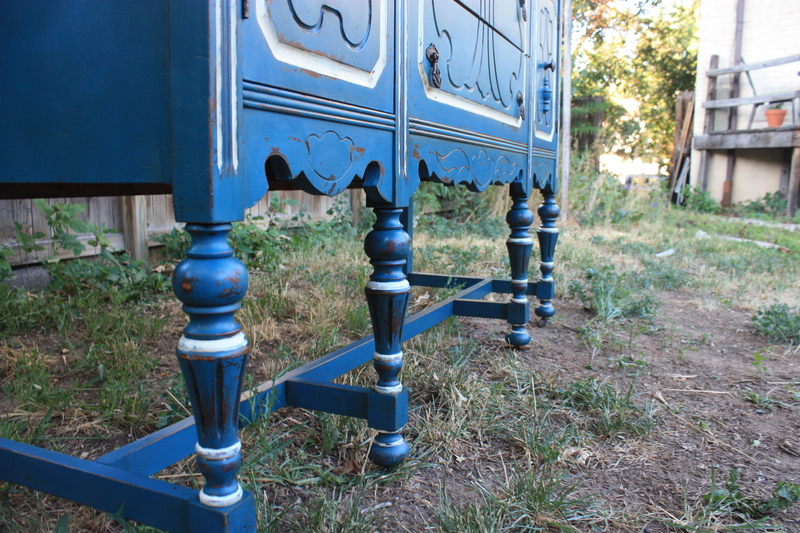 No, I wasn’t feeling guilty about painting this piece…it was pretty bad in some places and would have required a LOT of work and money to restore to a wood finish. I did, however, struggle with the direction I should take with such a beautiful and classic piece. Does this dilemma sound familiar to you? I know quite a few business-oriented artists that have dealt with this struggle many times in their own form of creativity. We are constantly striving for the balance between unique, bold, inspirational art and practical, marketable, appealing design. The trick, is to not lose our individual eye…the creative and unique perspective that makes us the artist that we are. So one day while I was pedaling hard into a fierce headwind and could hear nothing but the rush of air over my ears, I was lost in thoughts of self-doubt. And as I kept pedaling, I reached the penultimate point of my route and suddenly the headwind broke. Suddenly, all was quiet, and in that exact moment I achieved clarity on my dilemma: “Create what you love, create for yourself, and the rest will follow.” What does that mean? It means: “I don’t do neutral!” I’m BOLD, and I’m beautiful. Just like The Apollonia! And those legs…my, oh my, those legs! Because this buffet has so many points of intrigue and interest, I used a few subtle, and not-so-subtle, techniques to draw the eye to them. What do you think? Do you love it? Let me know by commenting! 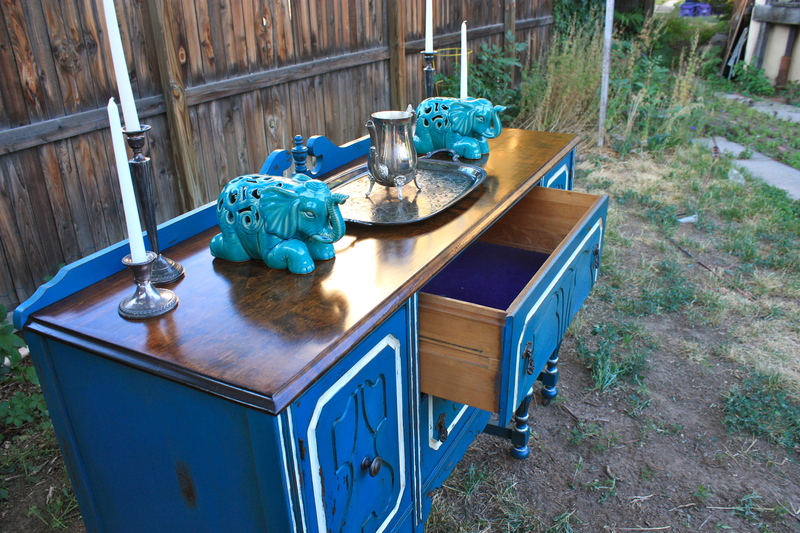 This beautiful buffet is for sale. If you are interested, please email me for dimensions and price. Oh, and do you love my little elephants? I am WITH you on using fun colors, great choice! I only use whites to mix with – no blah colors in my booth! Beautiful job. So glad you followed your heart and not give into the self doubt. Love the way you wrote this post because DIY is so cathartic and self reflective. It is absolutely beautiful! I love that color!! The piece is soooo much better looking. Stunning transformation. I’m the same as you when it comes to painting these antiques. I love the blue. I did one a few months ago in an ultra-marine blue (Hello!!!) on an almost identical buffet as yours. If you get a chance, I’d love your opinion on it! Oh-em-gee. I saw your buffet a while back and was in LOVE with it. I think I even pinned it to one of my inspiration boards on pinterest. One of my favorite aesthetics is bright, saturated, modern colors paired with the warmth and richness of stained wood. Your buffet does that so perfectly! 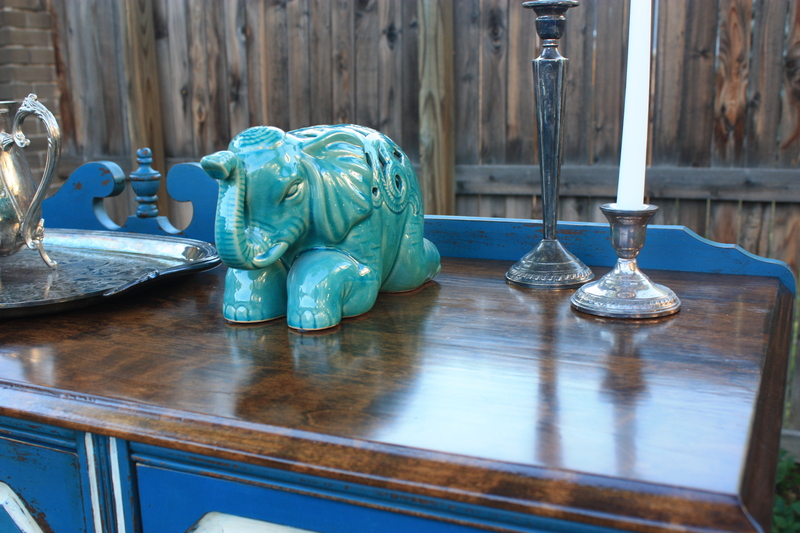 I’ll be emailing you soon…I want to hear more about your experiences with the Real Milk Paint company. SO gorgeous! 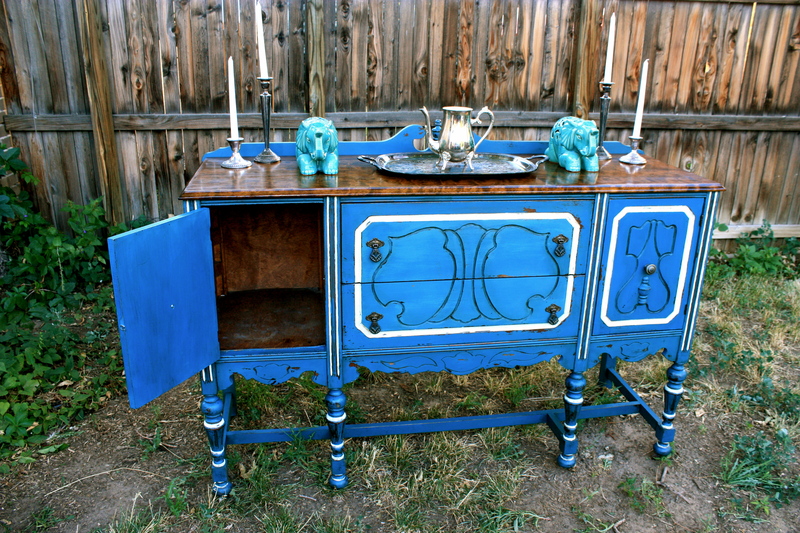 I am in love with this piece, and the color!!! 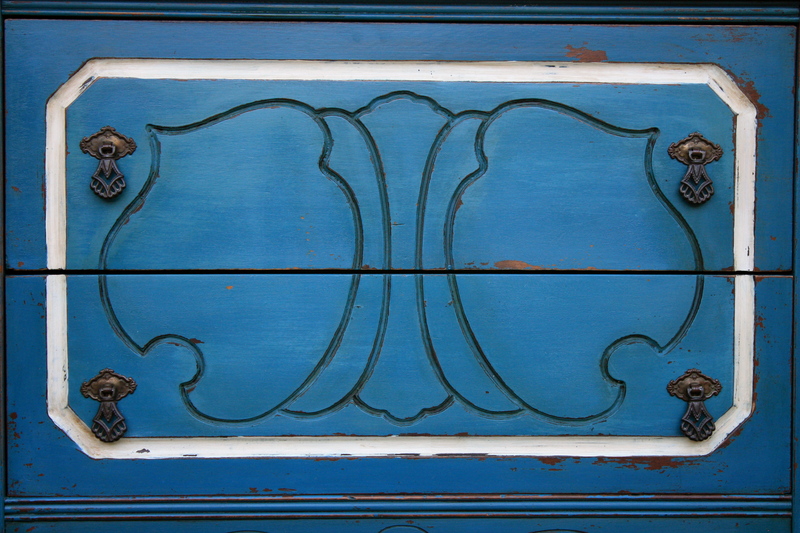 I love this fun color and the mix of stained wood. That top is gorgeous and so are all the details. You def. have to listen to your inner gut when working with furniture. I think you did a lovely job. Thanks for sharing at Silver Pennies Sundays. Thanks so much for featuring my buffet, Danielle! You DO like bold colors :). 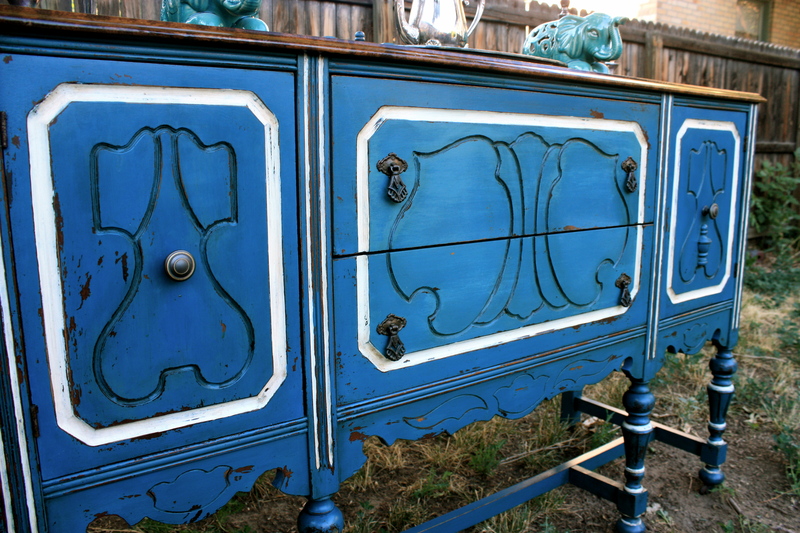 Love it….that color is fabulous, and it with the white detailing and the wood top are perfect! Thanks so much Gretchen! It’s true…I love bold colors. I used to put the bold colors on my walls…now I leave the walls neutral and use furniture to bring in pops of saturated color! This piece is gorgeous! Thanks so much for the MMS tips (this is Jessi from Vanilla Bean). I, too, am a very impatient person. I’ll definitely try waiting longer next time. 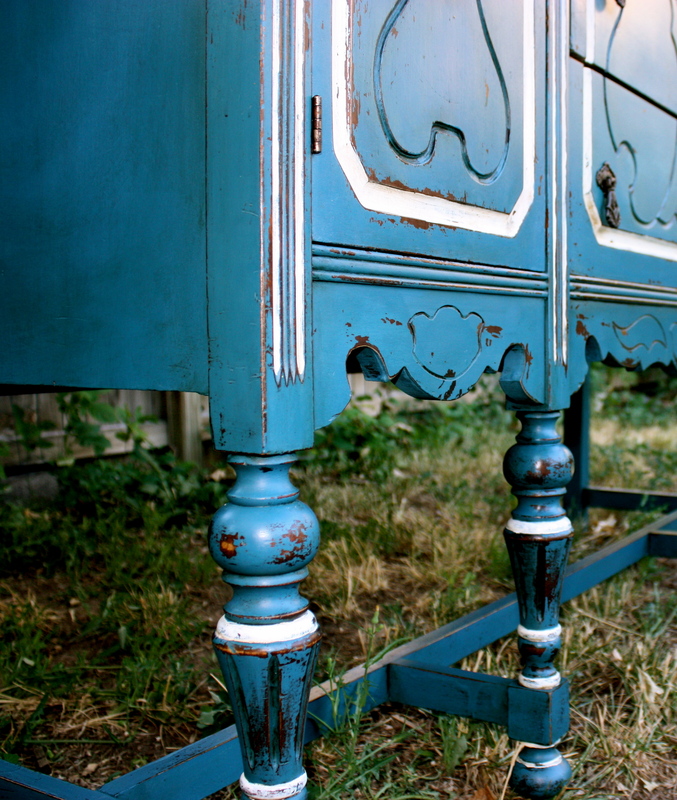 I have a buffet similar to this that I did with chalk paint. I’m thinking of redoing it and using it as a bar. Thanks for the inspiration! Found your work through The Dedicated House, Anything Blue Friday. Love how the top of that piece turned out, just beautiful. How does bright blue sell in your part of the country? 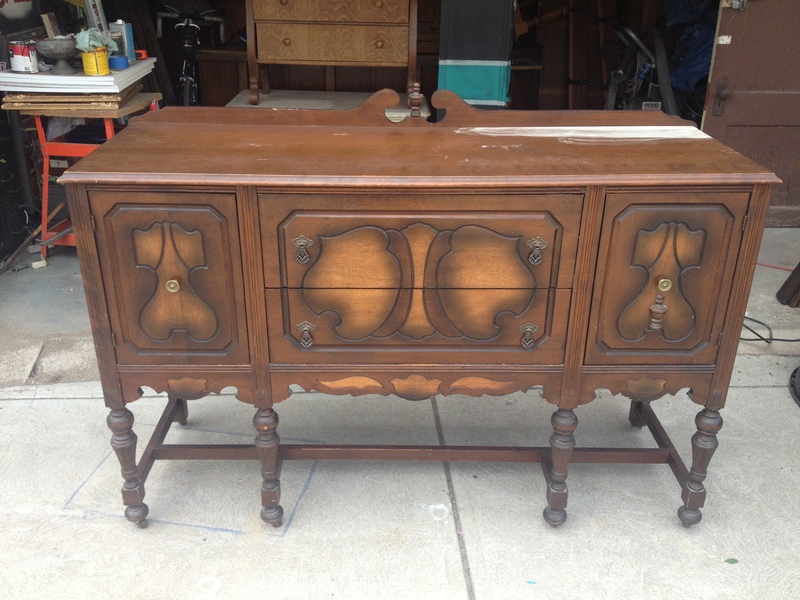 I just finished a 1940’s Jacobean side board myself. See it on my blog. I’ve sold a few smaller, less expensive pieces in bright blue. This is the first large piece I’ve done in a bright blue that wasn’t a custom order. So, I’m not sure how well they sell here in CO. I’m happy with this buffet in my house right now so I’m in no rush to sell it 🙂 I love the buffet you did as well. 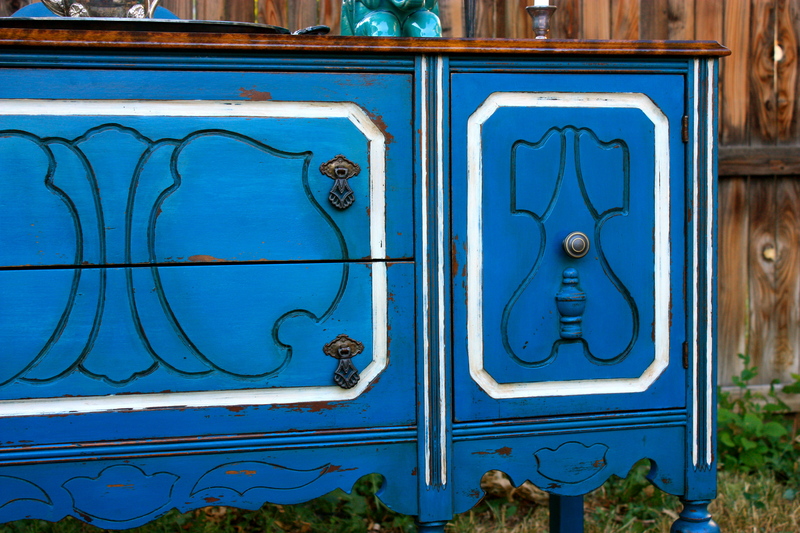 I wish the original finish on the doors and drawers of this buffet were nice enough to leave unpainted. 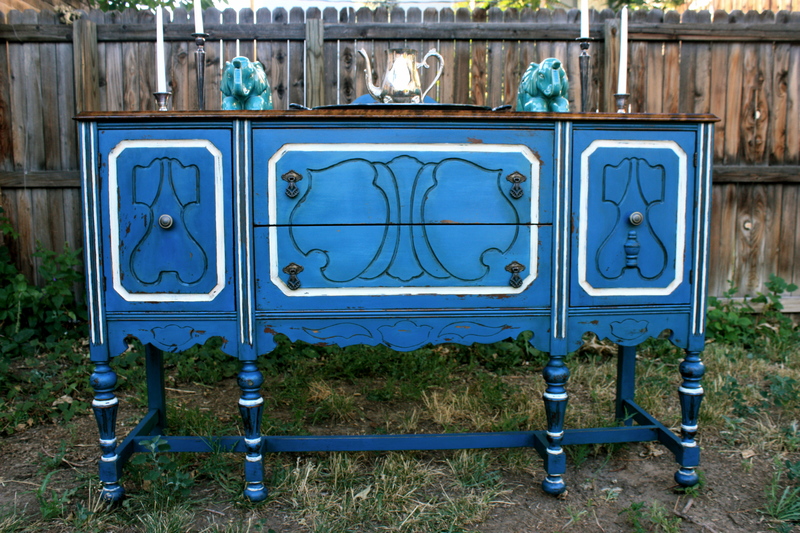 What a beautiful buffet in a great color choice! I was looking for a place to email you but didn’t find a link anywhere. However I was wondering if this beauty is still for sale!? Saw this on Better After. This is stunning! I love the fading colors and the depth you were really able to bring to this. Fantastic job! I’m glad you didn’t go with boring neutral.